Will (Matt Damon) works as a janitor at MIT and is secretly a genius, but he prefers to spend his time with his mates. After solving a maths puzzle set by Professor Gerald Lambeau (Stellen Skarsgard), he is discovered, but his behavioural and emotional problems need to be dealt with. 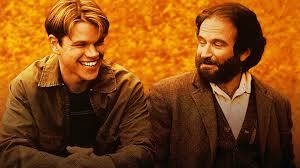 Eventually, he finds a fit with Sean Maguire (Robin Williams) who is dealing with his own problems. And chuck in gorgeous British beauty Skylar (Minnie Driver). This film may always be known as the film that rocketed unknown actors Matt Damon and Ben Affleck into the spotlight as (or so the legend goes) fed up with not getting work, they wrote an awesome script and here it is. I don’t know if that is true as such, but I will say that after watching several of the Ben Affleck directed films, Good Willing Hunting gives us an indication of his talent. He knows how to craft a good, emotionally engaging story with flawed characters trying to beat the odds. It’s a good film. Real good. Good Will Hunting won Oscars for Best Actor in a Supporting Role (Robin Williams) and Best Writing, Screenplay Written Directly for the Screen (Matt Damon and Ben Affleck).